Visit our stores to sell or trade your used entertainment items. Welcome to the Guild of Blades Retail Group. A unique venture in games retailing. 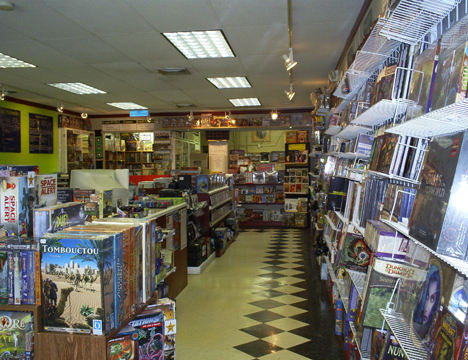 GOB Retail is a store that combines hobby games and used video game retailing, local printing and print-on-demand services all under one roof. GOB Retail seeks to provide a retail environment designed to service the entire hobby game market, from the sale of great games from leading manufacturers and prolific small press publishers to POD printing and other professional sevices for game and fiction publishers, plus wholesale distribution to independent retailers. Whether you are a game hobbyist, a game publisher, game designer, fiction author, game retailer or any combination thereof, GOB Retail has something for you. Game and Fiction publishers should check out our Print-on-Demand services for POD Card Games, Books and Mini Book printing. The Guild of Blades Retail Group is ideally positioned to help small and independent publishers with our Retail, Wholesale and Master Distribution programs. Lastly, we also offer a host of affordable Publisher Services from Web Design, Graphic Design, Publishing Consulting and Computer Programming for small businesses. GOB Retail was born from a close association with its sister company, the Guild of Blades Publishing Group, but is not directly affiliated with or owned by GOB Publishing and is utilizing the Guild of Blades name under license. If you have never heard of the Guild of Blades Publishing Group before, check out its large catalog of great games. We can even print and professionally bind your PDF games, game accessories and books. Visit our Retail Store in Madison Heights, MI.